Although Jodie Foster has not officially come out to the press, as far as her virtual life is concerned, she’s out. "Because she has lived with producer Cydney Bernard for several years, some people assume that she is a lesbian, but Foster has not made any public statements regarding her sexual orientation." "Has been in a serious relationship with Cydney Bernard since they met in 1993 on the set of the movie Sommersby"
Oh if I didn't want to keep my job, this would have been the moment where I would have asked Jody about her girlfriend, and why she couldn't come out as a fine example of a well adjusted role model for the gay community. 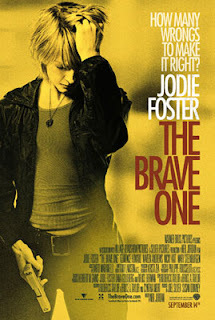 Jodie Foster's star turn in The Brave One was good enough for the top spot of the U.S. box office. America loves her. She's a great role model and one of a child actress that made the cross over into adult acting. And yes, I want her to come out so that people who are struggling might realize that hey Jodie's gay and she's OK.
Others who came to the premiere: Barbara Hershey who Currently lives with her partner, actor Naveen Andrews from the TV series "Lost" (2004), who is 21 years her junior. Naveen is in the movie. Barbara has had so much surgery that she looks at least 21 years younger than her 59 years. Robert Downey Jr, I have no idea why he has blond hair, and this is one shot that doesn't work well being next to the door, but it looks like I am on Roberts home video - CHEESE! Terrance Howard, a class act. He never takes a bad picture. Sorry for the delay in posting. After Fashion week I was burned out, having attending 21 events in five days; spending countless hours prepping my photos, I just needed a break from looking at my photos. The Jodie Foster event was last monday. I didn't get credentialed, but if you show up, the PR are usually nice enough to let the photographers shoot from a pen that is adjacent to the door. Sadly the photos aren't that great as their are always people in the back, and the gates. But sometimes you may get that lucky shot. I like the Jodi picture. She is so amazingly beautiful. I just wish that she would come out so the community could have another class act role model, instead of Rosie O'Donnell. I'm Swedish - I was looking for Foster/Bernard and found you.